Some of the biggest challenges I've faced while teaching myself data science have been determining what tools are available, which one to invest in learning, or how to access them. For example, once I reached the stage in my training where I was ready to add deep learning to my repertoire, I was baffled on how troublesome it was to setup Keras and TensorFlow to work with Jupyter notebooks via the Anaconda distribution. Most solutions glossed over key steps, others just didn't work. After some digging, I came up with my own solution and decided to share it in detail with the community. I settled on Keras because it provides a high-level, user friendly API for several deep learning libraries such as TensorFlow, Theano or Microsoft Cognitive Toolkit. Because TensorFlow is an order of magnitude more popular than the rest and is growing rapidly, it was the logical choice for Keras' backend. Thankfully, both libraries are written in Python, which circumvents a layer of friction for me. Note: this tutorial is for Windows users. Apologies! Anaconda is a free and open-source software distribution for data science. In a nutshell, it's an up-to-date, comprehensive bundle of the most popular tools and libraries in this field and enables you to dive in quickly and easily. Of course, you could use pip, Python's default package manager, to install these libraries but that would likely take a while considering there are hundreds to choose from. In addition, newcomers typically don't know which libraries are useful and which are optional. Most importantly, a library may build off another library (the latter is called a dependency), so it's crucial to install them in the correct order and use the appropriate version of each one to ensure all libraries play nicely. Fortunately, Anaconda takes these responsibilities off your shoulder. 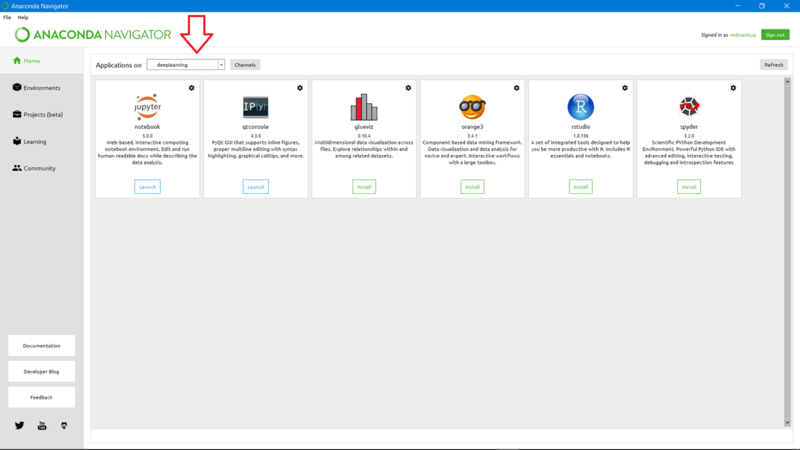 First, the installer comes with the core libraries for data science to get you up and running immediately. In addition, Anaconda includes a language-agnostic package manager called conda that enables you to add more libraries later. As the cherry on top, conda is also a top-notch virtual environment manager, so you don't need virtualenv or venv. For those new to virtual environments, think of them as tools to keep dependencies used by different projects or tasks in separate locations to avoid potentially messy conflicts. Later in this tutorial, we'll create a conda environment for our deep learning tasks. To get started, download Anaconda with the latest version of Python—don't worry, you can always create a conda environment that uses an older version if needed. The installation will take a few minutes so grab a coffee! 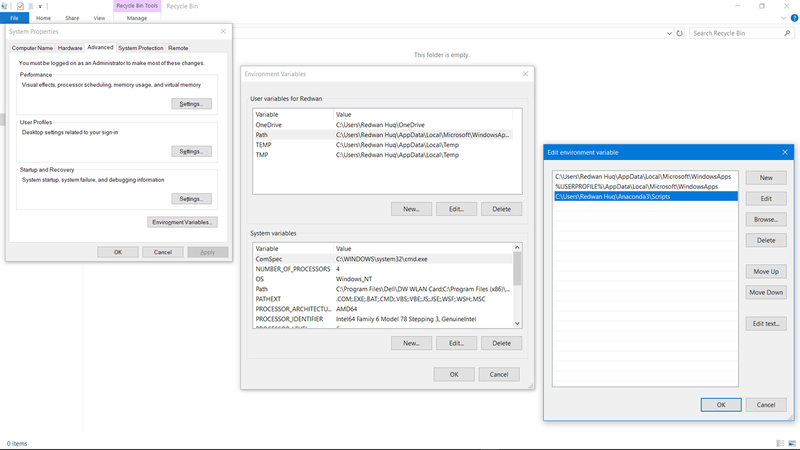 Continuum Analytics, the company that maintains Anaconda, elected to remove the option to add the distribution to the PATH variable during the installation process in version 4.4. Basically, this allowed you to interface with conda via the command line instead of the GUI-based Anaconda Navigator, which I find clunky. Because we need to access the command line to install Keras and TensorFlow, this step is mandatory. No problem—manually adding Anaconda to the PATH variable is super easy. Take a look at the example below if you need help. Let's begin by opening Command Prompt and creating a new conda environment with Python. Feel free to change deeplearning to whatever you'd like to call the environment. You'll be prompted to install various dependencies throughout this process—just agree each time. Let's now enter this newly created virtual environment. If you're following along in Command Prompt, notice the prompt is now flanked by the name of the environment in parentheses—this indicates you're inside. Earlier, the Anaconda installer automatically created a conda environment called root that houses the core libraries for data science. Since we've now moved into a different environment, we can't access those libraries unless we re-install them and their dependencies in the new environment. Fortunately, we can use conda to install a few packages that cover everything we need. Because I make heavy use of the core data science libraries, I installed every package listed below. Make sure to install them in order listed below; only Seaborn and Scikit-learn are optional. IPython and Jupyter are a must for those who rely on Jupyter notebooks for data science (who doesn't?). Pandas includes the de facto library for exploratory analysis and data wrangling in Python. SciPy is an exhaustive package for scientific computing, but the namesake library itself is a dependency for Keras. Seaborn includes my favorite high-level visualization library. If you're still exclusively using Matplotlib for plotting, do yourself a favor and take a look. Scikit-learn contains the go-to library for machine learning tasks in Python outside of neural networks. We're finally equipped to install the deep learning libraries, TensorFlow and Keras. Neither library is officially available via a conda package (yet) so we'll need to install them with pip. One more thing: this step installs TensorFlow with CPU support only; if you want GPU support too, check this out. The first option is a lot faster. If you missed a step or made a mistake, you can always remove the conda environment and start over. Otherwise, you should have TensorFlow and Keras ready to go. Go forth and start and building! As always, don't hesitate to leave your comments below.